More importantly, one must exercise caution because some of the advice isn’t sound in light of recent scientific research. The best example of this is the idea that one should summarily cut an hour and a half or two out of one’s sleep time. This can work for some, but as blanket advice it won’t produce wholly positive results. To be fair, there are still people giving this advice, e.g. Arnold Schwarzenegger. In my view, two incorrect principles inform this belief—one is wrong in my opinion, and the other is being gradually killed by science. The first is the Western attitude that rest is a form of weakness that we—unfortunately—are forced to put up with, but which we should try to minimize (and even be vaguely ashamed of.) Rest is an essential part of the productivity formula. (Bennett both recognizes and denigrates the value of downtime.) The second notion is that sleep is just rest for the mind. There’s substantial evidence that sleep plays a major role in memory consolidation as well as ramping up healing actions into full gear. How is the book ahead of its time? Let me say that I mean ahead of it’s time for early 20th century Britain. In some parts of the world, the ideas I mention have been around for thousands of years. First, Bennett describes the importance of training the mind to not be in a constant state of flux, so that one can be less reactive and subject to petty impulses. Bennett doesn’t use the terms “meditation” or “mindfulness” (he talks about “concentration”), but what he describes is meditative practice. What he describes is a bit more cerebral than one would recommend for a beginning practitioners of meditation in light of what we know from the people who do this stuff really well (e.g. Buddhists and Yogis.) While Bennett says that the one can use any object of concentration, he recommends passages from Epictetus or Marcus Aurelius. (Two stoic philosophers.) Note: I’m not disregarding the virtue of reading and actively thinking about the ideas of the Stoics. I’m just saying that it may take some preliminary concentration work on breath or a mantra to get to a place where one can get what one wants out of it. Second, the book suggests that one rethink one’s notion of happiness. Then, as now, it was common to think that—or at least behave as–if one accumulated enough wealth / stuff, one would achieve a state of happiness. Of course, there’s no evidence that that’s the case, and building evidence that it isn’t. Third, Bennett recognizes the folly of trying to make a massive change all at once. He suggests that one start with an hour-and-a-half a few times a week, and build from there as is manageable as long as time is available. Given the proviso that one should take what is useful and discard the rest, I’d recommend one give this a read. It’s particularly ripe for consideration if one feels that one has surrendered one’s free time to social media, TV, and brain candy books. This book is a two-in-one. It’s a pop sci book covering the science of sleep. However, it’s arranged as a self-help guide to teach one how to get the most from one’s sleep life. It covers a wide range of sleep related issues from how to minimize jet lag to how to master lucid dreaming. It also describes the sometimes dire effects of not getting enough quality sleep. Along the way one also learns about interesting anecdotes and research that may not change your quality of sleep, but could prove interesting or useful nonetheless—such as the research that shows a strong correlation between the position in which one usually sleeps and one’s personality. Along with the eight lessons, there are also eight assignments. Most of these assignments are surveys that help the reader understand what will work for them best specifically—as not all sleep advice is one-size-fits-all. However, there are other assignments like a mid-course recap exam, a call to attempt interpreting one’s own dreams (as opposed to relying on the generic dream interpretation guides which the science suggests are bunk,) and a suggestion to start a dream diary—with instructions for how to go about it. Another nice feature of the book are its boxed discussions of relevant research on such topics as segmented sleep (instead of sleeping through the night), narcolepsy, snoring, children’s sleep issues, etc. There’s also a Conclusion that reviews key information from the book in the form of a refutation of the common myths that abound on the subject of sleep, as well as a “manifesto” that repeats key elements of advice on good sleep. It’s a scholarly work, and so it include source citations. I learned a lot from this book. Granted a lot of the advice is commonsense (e.g. sleep in a dark, cool, and quiet place), but there are plenty of not so obvious tidbits as well (e.g. red light is okay, but blue light will keep one from sleeping.) There are also a lot of fascinating stories in the book to keep one interested. I’d recommend the book for anyone who wants to learn to improve their sleep lives. This is a short and simple book. Its premise can be summed up as “follow your dreams and all will work out.” It’s about a shepherd boy from Andalusia in southern Spain who yearns to travel. He sells his flock and sets out to do just that. Over the course of the book, he crosses North Africa from Gibraltar to the pyramids of Egypt and back. Along the way he faces many setbacks and barriers, but his willingness to adopt a positive attitude and roll up his sleeves and get to work allows him to overcome these obstacles. As he travels, mysterious guides and mentors–most notably the title-roled Alchemist–show up along the way to induce him to keep going rather than giving up. You will note that my middling rating is anomalous. Having skimmed through reviews of this book, I found they were overwhelmingly divided between 5 star and 1 star reviews. It’s rare for one to see the same book being cast both in the best and worst book role by various readers. However, that seems to be the case for this book. Some people adore this book and consider it life-changing. Others think it’s oversimplified tripe for granola-munching potheads and/or six-year olds. I suspect that Coelho is quite pleased. I know—as a writer—if you can’t get someone to love your book, you want them to despise it. Mediocrity doesn’t put one in good stead for building readership. Hate is a passionate response; it means the book struck some kind of chord. Clunkers are remembered just like perfect melodies; it’s the so-so performances that vanish into the background—or the bargain bin. Unlike the lovers and haters, I found this book to be just alright. It presents some good ideas, but not novel ideas, and it does so in a clear but not brilliant way. It wouldn’t hurt to read it as it’s very short and highly readable. Wanky pays an homage to Dale Carnegie’s seminal self-help book by calling it, “a book for its time–that time being one in which people were lonely, pathetic, and didn’t understand social networking.” The author’s central premise is that we live in very different times, and today people are inundated by Facebook friends they neither like nor find interesting. Furthermore, Wanky goes on to argue, gone are the days when likable people are liked. We live in an era in which douche-bags and drug-addled celebrities are gods among men. The book offers many headline examples, such as how Miley Cyrus’s career crashed as the sweet and admirable Hannah Montana, but then she caught her second wind by adopting the persona of a meth-addicted prostitute. 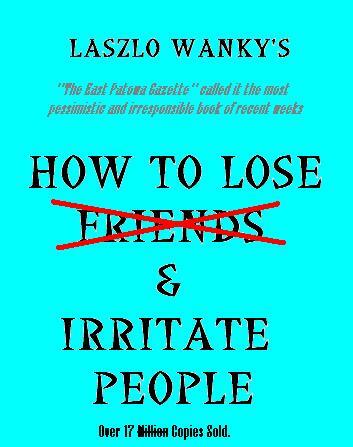 I’d recommend this book for anyone who doesn’t like friends and who really despises people’s indifference toward them. I have no doubt that by following Mr. Wanky’s recommendations, one can become a thoroughly loathsome individual in a matter of days. Lastly, Happy April Fool’s Day. This book by the renowned Vietnamese Buddhist monk, activist, and poet, Thich Nhat Hanh, offers pointers on how to live a life of mindfulness. Like most of Hanh’s works, this one is brief, concise, and the front and back matter account for about as much verbiage as the chapters themselves. The seven chapters that make up the book proper examine mindfulness from various angles, with various approaches, and have a loose organization. The most readable of these chapters–owing to its narrative format–is the last, which retells a Tolstoy story about an Emperor who receives three questions and–unable to find suitable answers by offering a reward to his subjects–dons a disguise and visits a hermit sage. Needless to say, the sage (and life events) enlighten the Emperor, and the answers revolve around the theme of mindfulness. Among the most thought-provoking of the chapters is one that proposes that one take one day of the week to focus on mindfulness. Hanh offers advice on how to best select and structure such a day. There is an odd postscript by one of Hanh’s students that is like those I’ve seen in other Hanh books. It’s an odd little testimonial. I put it in the filler category as anyone buying the book knows who Thich Nhat Hanh is and about the accolades he has received and, therefore, they don’t need a prologue telling them how awesome he is. It actually detracts from his persona as a wise man, because it makes one wonder who inspired the little ego trip. I suspect this is more a publisher desired addenda than an author inspired one, but, at any rate, it’s not useful. It can be interesting to hear about the war days, but there’s an outlet for that. Furthermore, I would think the place to tell us how awesome the author is would be at the beginning of the book–not the end. If one gets to the back matter, he must have done something to impress one. I’d recommend this book for meditators, would-be meditators, and anyone who thinks that life is slipping through his or her fingers because of constant stress and a runaway mind. LeShan’s book offers a secular and scientific guide to meditation. By secular, I don’t mean to suggest that it’s devoid of mention of religion. On the contrary, How to Meditate delves into a wide variety of meditation styles that have roots in religion, and it quotes from spiritual teachers across a range of religions–including the mystic branches of Christianity and Islam. I mention the latter because the book seems tailored to bringing individuals into meditation that do not normally think meditation as being their bag, which could include atheists, secular humanists, or those whose religious practices don’t involve a mystical component. I just mean that the book is secular in that it doesn’t advocate a specific religion or suggest that one needs to hold any particular spiritual beliefs to benefit from meditation. Also, by scientific I don’t mean to suggest that the book gets bogged down in the minutiae of EKG’s or the like. How to Meditate is readable to the general reader, except perhaps for chapter 11, which deals with using meditation in psychotherapy. [However, by the author’s own admission, one can skip that chapter with no great loss if you aren’t a therapist.] What I do mean to say is that LeShan takes an approach to meditation that is grounded in real-world, observable results. He tells the reader of the mental and physical benefits of meditation as they are discussed in the scientific literature. In other words, if you think that meditation is only for hippie-types who believe in auras and astral planes, this book may convince you otherwise. On the other hand, if you’re one who believes in auras, astral planes, or the idea that only one true guru / path exists, you’ll probably be miffed by this book. There are a couple of chapters devoted to ideas that people believe that both have little evidence of grounding in reality and which detract from meditation. This includes ESP, auras, strange maps of reality, and guru-worship. The core of the book is chapter 8, which explains how to do meditations of eleven different kinds. The book addresses single-point awareness, breath counting, thought watching, bodily awareness (specifically, Theravada Buddhist style meditation), word association (1,000-petaled lotus), mantra meditation, meditation on “I”, movement meditation (particularly Sufi-style), sensory awareness, safe harbor meditation, and unstructured meditation. The first ten are all types of structured meditation, and an earlier chapter is devoted to distinguishing structured from unstructured approaches to meditation. There is also an earlier chapter that discusses a broad taxonomy of meditation and sub-classes of meditation. The book is logically arranged for the most part. It begins with a chapter on why one should meditate. This first chapter sets up two chapters that deal with the psychological and physiological effects of meditation. There is one oddity of organization. The core “how-to” chapter is bookended by a chapter on ESP and one on various pitfalls of spiritualism. It would seem these two chapters should go together as they both deal with things that detract from meditative practice, and not with the central chapter wedged between them. The last couple chapters and the Afterword aren’t as beneficial for the general reader as the first 3/4ths of the book or so. One of those chapters is the aforementioned chapter for psychotherapists and the other deals with the social significance of meditation. The last chapter before those that I found superfluous, however, is one addressing the question of whether one needs a teacher to learn meditation. This pro and con discussion seems like a good way to end this book. Overall, I’d recommend this book for those who are new to meditation, those who are seeking to expand their practice to new types of meditation, and those who are interested in the mind in general. As I mentioned, if you think of meditation as a route to see the glow of chakras or to commune with the dead, this probably isn’t the book for you—you’re likely to find its disregard for such otherworldly endeavors to be unappealing.